THE Aalst Supporters Group is coming over for to England the 5th time now to see a Grimsby game and the number of Aalst fans wanting to join us for a GTFC-match keeps growing. Every year we come over to see a league game, this year we picked the last match of the season against Newport and of course the match at Wembley. When we came the first time, a match against Notts County about six years ago, there were 5 of us and now there are 40 of us are making the trip. we've been working on a solution to be able to take more Aalst-fans with us. And now for the trip to Wembley I'm organising a coach. 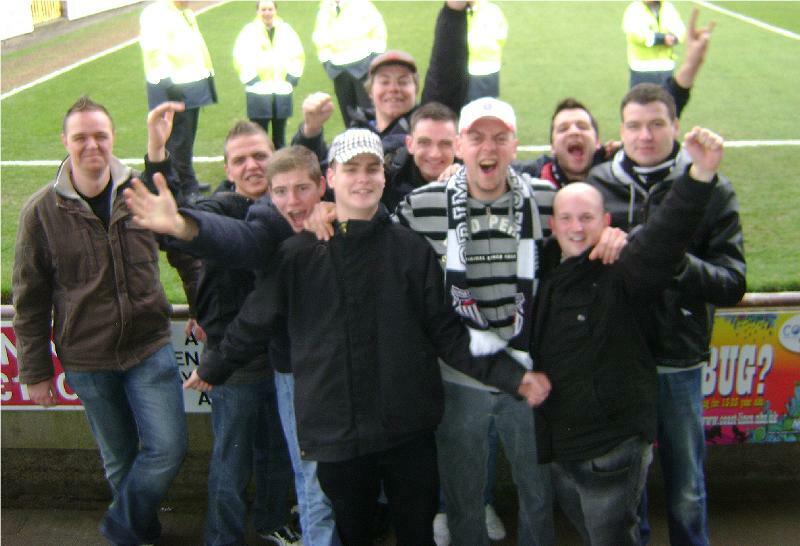 For the Newport-game we come with a minibus with 9 Aalst fans. Our own team had its own Financial and sportive troubles, we know what it is to have a hard time as a fan with your team. But we also known what it's like to be die hard fans and to fight back over and over. Our colours are Black and White. We played in Belgian First Class for many years and even got through to the UEFA-cup in 1995, where in the First round we eliminated Bulgarian champion Levski Sofia and got a 2nd round loss against AS Roma. After that Financial troubles started and after a few years Second Class we had to be relegated to Belgian 4th class to build up again. There we were immediately promoted to 3rd class and now since a few years we are back into 2nd division. We now have a calm year with the only ambition to stay up. Despite being in lower classes we still get 3500 fans at home and take up to a 800 fans on away matches, which is quite extraordinary for Belgian clubs in lower classes. We are known in Belgium for having die-hard fans and a thrilling atmosphere. For the city of Aalst, the most important thing is carnival three days a year when the whole town goes bananas. we're keen on English football and certainly the passion of the fans at the stands. We wanted to visit a team in a lower division. Cause when you go to Premier League you're just a ticket number in the stadium. We wanted to feel the football at its origins, a smaller team with passionate fans, also colours black & white of course. And getting involved: getting to know the fans, have a sort of brothership-band between our clubs too. And I started searching the Internet and came to Grimsby Town, being black&white, having passionate fans, a nice history (and also for example, have had Financial trouble and dropped down the league. So we had something in common.) And then I met Ian Blakemore (Grimsby fan) online who helped me plan our First trip and became a friend and who helped us out for everything we needed. And the rest is history. We were fond of the team from the very first minute. Meanwhile we made friends there, Cleethorpes is also a nice place to go out. And we come to a match at Blundell Park once a year. It takes us a 17 hour trip to get there (by boat and by car). But any time we came over we had fun and it was worthwhile. we're fond of GTFC and the Pontoon stand now. And we hope in the future the band between our clubs grows and we even had some Town fans over twice to see an Aalst match. We will certainly be back in Cleethorpes later this year (the end of April). For us is not always easy to follow GTFC, because we can't see any tv reports of the Grimsby matches, so we follow through the Internet, via thefishy.co.uk or Radio Humberside. So for me it’s impossible to say much about the players or the coach for example. We're all really looking forward to our Wembley trip! !